The Flagler Sheriff’s Employee Assistance Trust, Inc. (FSEAT ) was the visions of Sheriff Rick Staly and was founded in 2017 to aid Flagler County Sheriff’s Office employees in time of critical need. Provide financial assistance to employees during a personal crisis. Give support to the families of slain Flagler County Sheriff’s Office deputies. 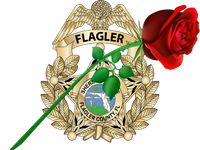 Recognize Flagler County Sheriff’s Office deputies killed in the line of duty. We, in the law enforcement community, know all too well that tragedy is a part of life. When tragedy hits deputies and their families, we are there. The law enforcement community is a tightly-knit one. Flagler County Sheriff’s Office employees are sworn to protect and serve our community, which is key to the Flagler County Sheriff’s Office. FSEAT now turns to the community for your support. Area businesses, organizations, and Sheriff’s Office employees personal payroll deductions continue to make this program possible through their generous contributions. We have been blessed with community support and we are grateful for it. We continue to seek financial support to expand the FSEAT program. FSEAT serves all Flagler County Sheriff’s Office employees, both sworn and civilian. Each application for assistance undergoes a detailed review process to ensure it meets the guidelines set for.